Throughout the mid and late 1800’s, a rapid growth in population settled along the Truckee River. They needed water for their mills, livestock, and farmlands. Numerous diversion dams were haphazardly built along the Truckee for personal use. There was no water policy to keep the Truckee River flowing. In 1899, the Federal Government stepped in to survey the water system from Lake Tahoe to the Carson Valley. The Secretary of the Interior authorized the Truckee-Carson project in 1903. Part of that project was the Lake Tahoe Dam. The Lake Tahoe Dam was completed in 1913. 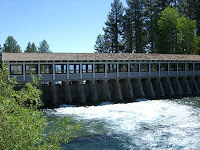 Lake Tahoe Dam, located in Tahoe City, is a concrete slap with 17 vertical gates to control flows. The dam was modified in 1987 for seismic safety by adding stabilizing walls. The Lake Tahoe Dam controls the top six feet of Lake Tahoe. The Bureau of Reclamation, in partnership with Truckee Meadows Water Authority and the Truckee Carson Irrigation District, celebrated the centennial anniversary at the dam on August 30, 2013. The Lake Tahoe Dam and the 150 year anniversary of Tahoe City will be celebrated through Labor Day.